NOTIFICATION: Gujarat Public Service Commission (GPSC), Gandhinagar inviting online applications for filling up 1162 vacant posts of Assistant Engineer, Assistant Professor, State Tax Inspector, Specialist Service, Agriculture Officer, Police Inspector, and Other from eligible and interested willing candidates. It is latest & good information for unemployed personnel those who are looking for these new Jobs in Government sector & other organizations. Job seekers, who wish to apply for these vacancies regarding GPSC Recruitment 2019, must have passed Degree in concerned Engineering, any Graduate, Post Graduate, B.Ed/Ph. D, Diploma, MBBS in concerned disciplines with a required experience if asked. Applicant’s upper age should be as per Govt. rules and age relaxation is applicable to all reserved category candidates i.e.SC/ ST/OBC/ PWH/ Ex Servicemen /Women candidates etc. 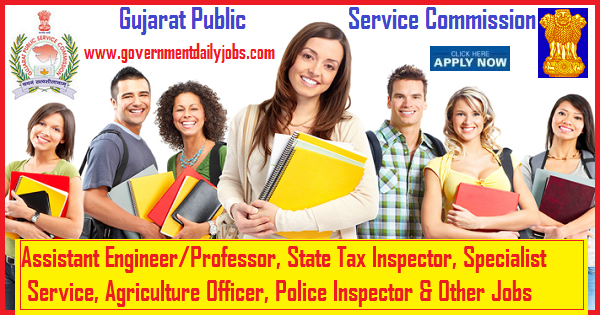 NO OF VACANCIES: 1162 vacant posts of Assistant Engineer, Assistant Professor, State Tax Inspector, Specialist Service, Agriculture Officer, Police Inspector, and Others through Gujarat Public Service Commission (GPSC), Gandhinagar. 1. Assistant Engineer (Mechanical), Class-2:	21 posts. 2. Research Officer, General Statistical Service, Class-2:	23 posts. 3. Assistant Engineer (Civil), Class-2, Roads and Building Department:	285 posts. 4. State Tax Inspector:	200 posts. •	Political Science:	04 posts. 6. Assistant Inspector of Motor Vehicle, Class-3:	25 posts. •	E.N.T. Surgeon:	24 posts. 8. Agriculture Officer, Class-2, Agriculture, Farmers Welfare and Co-Operation Department:	101 posts. 9. Police Inspector (Unarmed), Class-2:	60 posts. 10. Gujarat Engineering Service, Class-1 and Class-2:	38 posts. 1. Assistant Engineer (Civil): A passed of Degree in Engineering (Civil) discipline from any recognized University. 2. Agriculture Officer, Class-2, Agriculture, Farmers Welfare & Co-Operation Department: A passed of a Bachelor’s degree in Science (Agriculture) of any of the University recognized. 3. Gujarat Engineering Service, Class-1 and 2 (Road & Buildings Department): A passed of a Bachelor of Engineering (Civil) or Bachelor of Technology (Civil) obtained from any of the Universities established or incorporated by or under the Central or State Act in India or any other educational institution recognized as such or declared to be deemed as a University under Section 3 of the UGC Act, 1956 or possess an equivalent qualification recognized by the Govt; Provided that the candidate who has appeared at a degree examination, the passing of which would render him educationally qualified for the Examination mentioned in sub-rule 1, but the result is not declared, shall also be eligible for admission to the Prelim. Exam. (2) Possess the basic knowledge of Computer Application as prescribed in the Gujarat Civil Services Classification and Recruitment (General) Rules, 1967. (3) Possess adequate knowledge of Gujarati or Hindi or both. 4. Research Officer: A passed of Master Degree in Engineering (Civil) or Technology (Civil) or Geophysics or Geology obtained from any of the University recognized. 5. Police Inspector: A passed of Graduate or appeared in last year or last semester of any Graduate Exam-Degree obtained from any of the Universities established or incorporated by or under the Central or a State Act in India; or any other educational Institution recognised as such or declared to be deemed as a University under Section 3 of the University Grants Commission Act, 1956; or all candidates who are declared qualified by the commission for appearing in the Main Examination shall be required to produce proof of passing the degree examination along with their application for the Main Examination. The candidate who fails to produce proof of passing the degree examination shall not be eligible for admission to Main Examination. Possess the basic knowledge of Computer Application as prescribed in the Gujarat Civil Services Classification and Recruitment (General) Rules, 1967. (4) Possess adequate knowledge of Gujarati or Hindi or both. 6. Assistant Inspector of Motor Vehicle, Class-3: A passed of a Diploma in Mechanical Engineering (3 years course) or Diploma in Automobile Engineering (3 yrs. course) or (2) a Degree in Mechanical engineering or Automobile Engineering of a recognized University or deemed University. 7. Microbiologist (Specialist Service), Class 1, Health and Medical Services: A passed of a Degree of Bachelor of Medicine and Bachelor of Surgery and Possess a Post-Graduate Degree or a Post-Graduate diploma in respective subject as shown in the detailed advertisement against each post obtained from any of the Universities established or incorporated by or under the Central or State Act in India; or any other educational institution recognised as such or declared to be deemed as a University under section 3 of the University Grants Commission Act,1956; or possess any other equivalent qualification specified in the first or second schedule to the Indian Medical Council Act,1956; (2) Possess the basic knowledge of computer application In Gujarat Civil Services Classification and Recruitment (General) Rules, 1967. (3) Possess adequate knowledge of Gujarati or Hindi or both. 8. Pathologist (Specialist Service), Class 1: A passed of a Degree of Bachelor of Medicine and Bachelor of Surgery and Possess a Post-Graduate Degree or a Post-Graduate diploma in respective subject as shown in the detailed advertisement against each post obtained from any of the Universities established or incorporated by or under the Central or State Act in India; or any other educational institution recognised as such or declared to be deemed as a University under section 3 of the University Grants Commission Act,1956; or possess any other equivalent qualification specified in the first or second schedule to the Indian Medical Council Act,1956; (2) Possess the basic knowledge of computer application In Gujarat Civil Services Classification and Recruitment (General) Rules, 1967. (3) Possess adequate knowledge of Gujarati or Hindi or both. 9. Radiologist (Specialist Service): A passed of a Degree of Bachelor of Medicine and Bachelor of Surgery and Possess a Post-Graduate Degree or a Post-Graduate diploma in respective subject as shown in the detailed advertisement against each post obtained from any of the Universities established or incorporated by or under the Central or State Act in India; or any other educational institution recognised as such or declared to be deemed as a University under section 3 of the University Grants Commission Act,1956; or possess any other equivalent qualification specified in the first or second schedule to the Indian Medical Council Act,1956; (2) Possess the basic knowledge of computer application In Gujarat Civil Services Classification and Recruitment (General) Rules, 1967. (3) Possess adequate knowledge of Gujarati or Hindi or both. 10. Psychiatrist (Specialist Service): A passed of a Degree of Bachelor of Medicine and Bachelor of Surgery and Possess a Post-Graduate Degree or a Post-Graduate diploma in respective subject as shown in the detailed advertisement against each post obtained from any of the Universities established or incorporated by or under the Central or State Act in India; or any other educational institution recognised as such or declared to be deemed as a University under section 3 of the University Grants Commission Act,1956; or possess any other equivalent qualification specified in the first or second schedule to the Indian Medical Council Act,1956; (2) Possess the basic knowledge of computer application In Gujarat Civil Services Classification and Recruitment (General) Rules, 1967. (3) Possess adequate knowledge of Gujarati or Hindi or both. 11. Oto-Rhino-Laryngology (ENT Surgeon) (Specialist Service), Class 1: A passed of a Degree of Bachelor of Medicine and Bachelor of Surgery and Possess a Post-Graduate Degree or a Post-Graduate diploma in respective subject as shown in the detailed advertisement against each post obtained from any of the Universities established or incorporated by or under the Central or State Act in India; or any other educational institution recognised as such or declared to be deemed as a University under section 3 of the University Grants Commission Act,1956; or possess any other equivalent qualification specified in the first or second schedule to the Indian Medical Council Act,1956; (2) Possess the basic knowledge of computer application In Gujarat Civil Services Classification and Recruitment (General) Rules, 1967. (3) Possess adequate knowledge of Gujarati or Hindi or both. 12. Assistant Professor (असिस्टेंट प्रोफेसर): A passed of Postgraduate degree with at least 55 % of the marks or at least its equivalent grade of B in the seven point scale with letter grades O, A, B, C, D, E and F at the master degree level in the relevant subject of any of the University recognized. Candidates should have cleared the National Eligibility Test (NET) / State Level Eligibility Test (SLET) for recruitment and appointment of Assistant Professor in colleges being conducted by the University Grants Commission, Council of Scientific and Industrial Research or such similar tests like State Level Eligibility Test (SLET)/State Eligibility Test (SET) accredited by the University Grants Commission. Provided that candidates who are or have been awarded Ph.D. degree in accordance with the University Grants Commission (minimum Standards and Procedure for Award of Ph.D. Degree) Regulation, 2009, shall be exempted from the requirement of clearing of NET/SLET. 13. State Tax Inspector: A passed of Bachelor’s degree in any discipline obtained from any of the University recognized. 1. Assistant Engineer (Civil): Candidate’s required age should be in between of 18 years – 35 years. 2. Agriculture Officer, Class-2, Agriculture, Farmers Welfare & Co-Operation Department: Must have completed 21 years and must not have completed 35 years. 3. Gujarat Engineering Service, Class-1 and 2 (Road & Buildings Department): Must have completed 20 years and must not have completed 35 years. 4. Research Officer: Max age 40 years. 5. Police Inspector: Must have completed 20 years and must not have completed 35 years. 6. Assistant Inspector of Motor Vehicle, Class-3: 19 to 35 years. 7. Microbiologist (Specialist Service), Class 1, Health and Medical Services: 21 to 40 years. 8. Pathologist (Specialist Service), Class 1: 21 to 40 years. 9. Radiologist (Specialist Service): 21 to 40 years. 10. Psychiatrist (Specialist Service): 21 to 40 years. 11. Oto-Rhino-Laryngology (ENT Surgeon) (Specialist Service), Class 1: 21 to 40 years. 12. Assistant Professor (असिस्टेंट प्रोफेसर): 21 years – 40 years. 13. State Tax Inspector: Max age 35 years. 1. Assistant Engineer (Civil): Rs. 44900-142400/- (Pay Matrix Level-8). 2. Agriculture Officer, Class-2, Agriculture, Farmers Welfare & Co-Operation Department: Rs.9300-34800/-+ Grade pay- Rs. 4400/-. 3. Gujarat Engineering Service, Class-1 and 2 (Road & Buildings Department): Pay Matrix Level No.11 Rs. 67,700-2,08,700/- (According to 7th Pay Commission). 4. Research Officer: Rs.53,100 – Rs. 1,67,800/-. 5. Police Inspector: Pay Matrix Level No. 08 Rs. 44,900-1,42,400/- (According to 7th Pay Commission). 6. Assistant Inspector of Motor Vehicle, Class-3: ₹ 38,090/- (Fixed Pay). 7. Microbiologist (Specialist Service), Class 1, Health and Medical Services: ₹ 67700-208700/- (Pay Matrics Level- 11). 8. Pathologist (Specialist Service), Class 1: ₹ 67700-208700/- (Pay Matrics Level- 11). 9. Radiologist (Specialist Service): ₹ 67700-208700/- (Pay Matrics Level- 11). 10. Psychiatrist (Specialist Service): ₹ 67700-208700/- (Pay Matrics Level- 11). 11. Oto-Rhino-Laryngology (ENT Surgeon) (Specialist Service), Class 1: ₹ 67700-208700/- (Pay Matrics Level- 11). 12. Assistant Professor (असिस्टेंट प्रोफेसर): Rs.15600 – Rs.39100/- + Grade Pay Rs.6000/-. 13. State Tax Inspector: Rs.15,600 – Rs.39,100/- +Grade Pay Rs.6000/-. REQUIRED APPLICATION FEE: For said vacancy a non -refundable application fee is to be paid by the candidates as per rules. An amount of Rs. 100/- + Postal Service charges to be paid by Genaral & OBC candidates through online mode only like Debit Card, Credit Card or Net Banking. No application fee from SC/ST/PH candidates. SELECTION PROCESS: Applicants who are screened for applicability/ eligibility are being selected as per organization policy/rules depending on the basis of their performance in Preliminary Exam, Physical Test, Mains Test & Interview. Help Line: Gujarat Public Service Commission, B-Block, First Floor, Multistoreyed Building, Laldarwaja, Ahmedabad – 380001, Gujarat. HOW TO APPLY: For said posts (GPSC Recruitment 2019 for 1162 Assistant Engineer, Assistant Professor, State Tax Inspector, Specialist Service, Agriculture Officer, Police Inspector, and Other Vacancies) eligible, willing and interested candidates may apply through online at official website up to last date. Applicants must retain a hard copy for future reference. 2. Eligible candidates are advised to open online application form. 3. Fill in your academic qualification, skill, experience and other related information as per the instructions. 6. Complete the GPSC Application Form with the essential data. 8. Take a printout of GPSC Recruitment 2019 Online application form for future reference. CONTACT ADDRESS: Gujarat Public Service Commission (GPSC), CHH Road, Sector 10A, Near CHH-3 Circle, Gandhinagar, Gujarat- 382010/Phone: 079 2325 8980. CONCLUSION: Gujarat Public Service Commission (GPSC), Gandhinagar invites online application for the recruitment of 1162 vacant posts of Assistant Engineer, Assistant Professor, State Tax Inspector, Specialist Service, Agriculture Officer, Police Inspector, and Other on regular basis from Indian residents who are eligible & interested; candidates can apply through online application. LAST DATE TO APPLY: 18-04-2019 for GPSC Recruitment 2019 for 1162 Assistant Professor, Specialist and various posts.